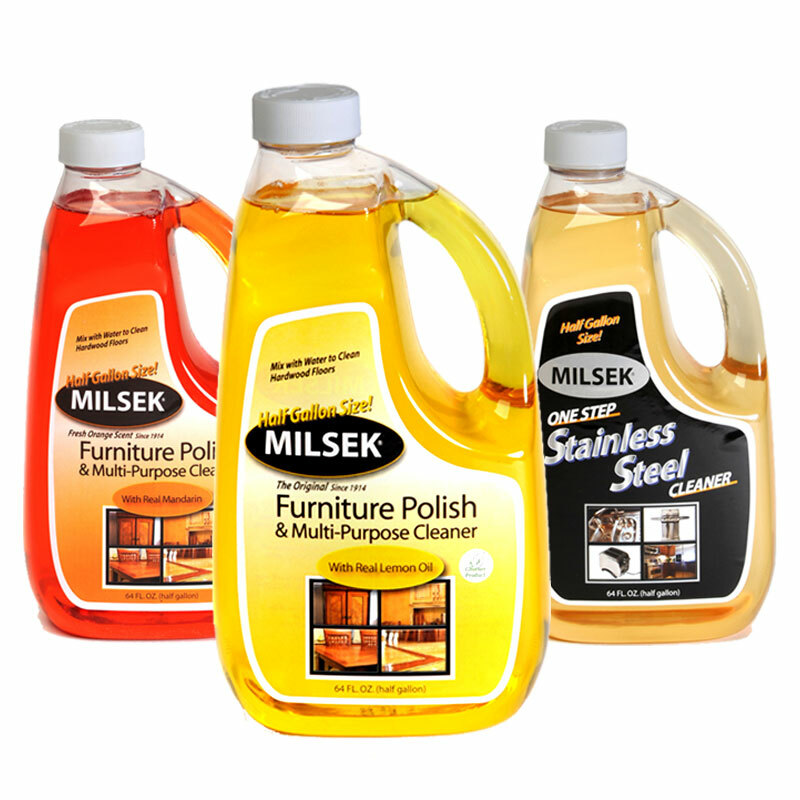 The Original Milsek Furniture Polish & Multi-Purpose Cleaner is the product that started it all. It’s the formula that has reached its 100 year mark with a proud stamp of Made in the USA. It is so diverse you can consider it a cleaning tool. Having a bottle in your home means you can clean and polish Kitchen Cabinets, Wood Floors, all Wood Furniture, as well as remove soap film from glass shower doors. 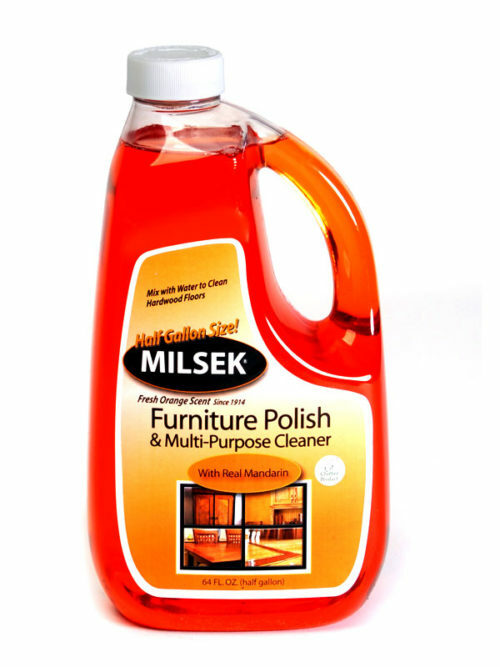 As a floor polish, mix ¼ cup of Milsek to 2 Gallons of water, wash the floor as you normally would. You will be amazed by the dirt that is removed and the shine that is left behind. It will gently clean while replacing the dirt with nourishing oils that your hard wood floors crave. For tips on how to clean wood furniture or for use as a kitchen cabinet cleaner, use a slightly damp, soft cloth (an old t-shirt will do), sprinkle with Milsek and wipe with the grain of the wood. Enjoy the fresh, clean smell and appearance of a job well done. Don’t just clean it. Milsek it! All Wood Surfaces – Milsek is safe to use on all wood products and so much more. 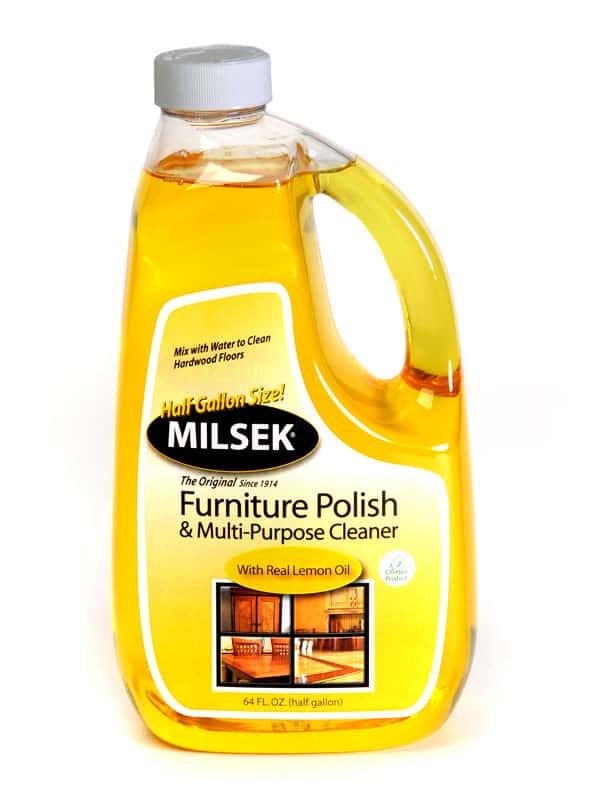 Kitchen Cabinets – Milsek Furniture Polish & Multi-Purpose Cleaner with Lemon, Orange or Holiday Oil is unique because it Polishes, Cleans and Protects your wood cabinets in one easy step. 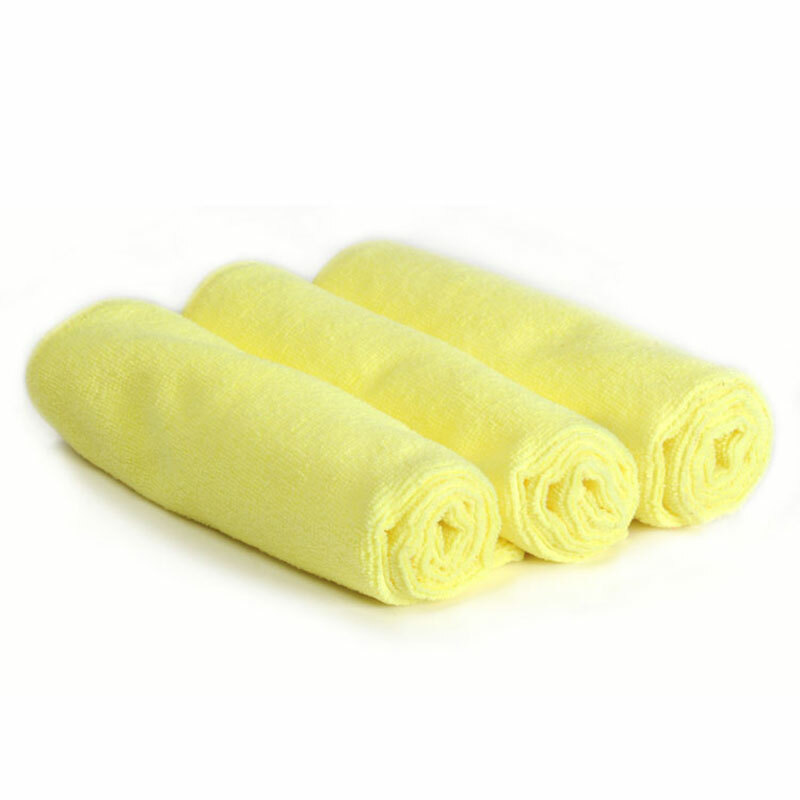 Slightly dampen a soft cloth and apply Milsek to it. Wipe down your cabinets. Milsek will remove the grease and grime and restore your wood to its natural luster. Milsek leaves no harmful build up because there are no damaging waxes or silicones in it. Safe for daily use. Heat Rings & Water Rings – Milsek will remove most heat rings and water rings. A heat ring in your dining room table is usually not in the finish of the wood. Heat rings are in the products you have been putting on your wood that have wax and silicone in them. As Milsek removes the wax and silicone it will also remove the heat ring. Fine Scratch Marks – Milsek will cover most fine scratch marks. The wood finish will look beautiful again. Hardwood Floors – Milsek does an outstanding job cleaning and polishing your hardwood floors. 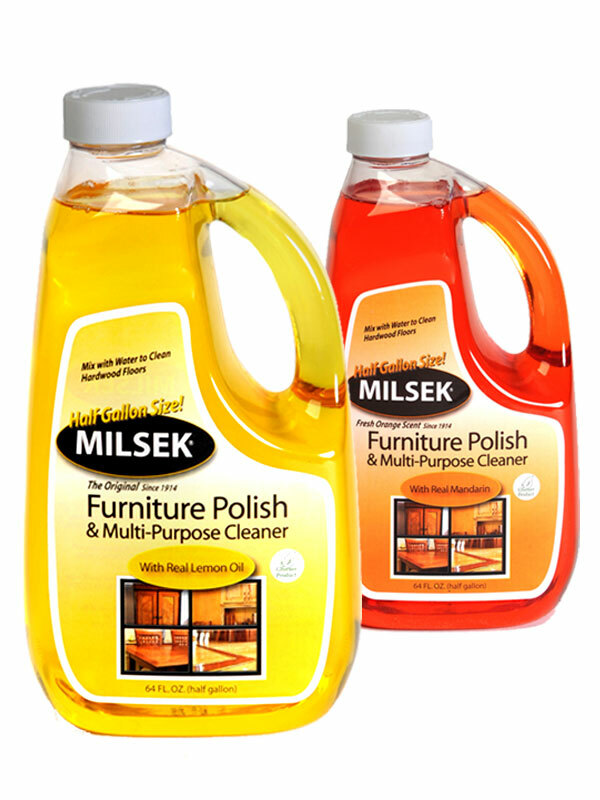 Mix ¼ cup of Milsek Furniture Polish & Multi-Purpose Cleaner to a gallon of warm water. Wipe down or mop your hardwood floors to clean & polish them. You will be amazed by how much dirt will be removed and the natural wood shine is there to enjoy. Paneling – Milsek will rejuvenate your paneling and bring that shine back. Shower Doors – That’s right we said shower doors. Milsek is a great multi-purpose cleaner. Apply Milsek to a slightly dampen towel and wipe the shower door down. Milsek will remove the soap build up easier than soap removers. Car Dash Board – Milsek will clean your car dash board. Slightly dampen your cloth and apply Milsek to it. Wipe your car dash down. 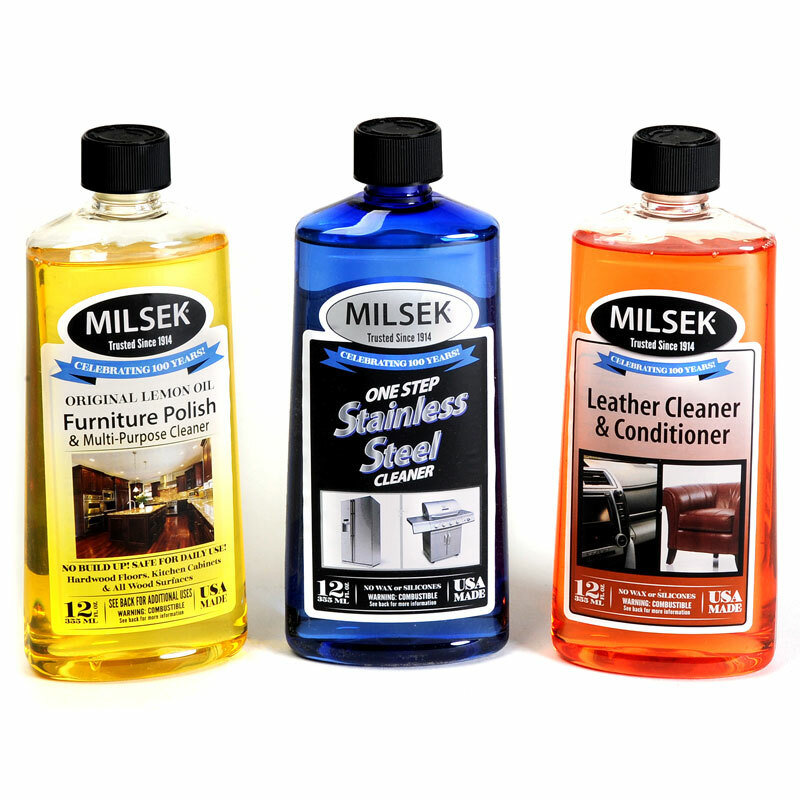 Milsek will clean your dash, leave a nice shine and your car will have a fresh pleasant scent. Wicker and Rattan Furniture – Wipe down Wicker and Rattan furniture. You can also pour Milsek in a bowl and use a paint brush to clean and polish the tight areas of wicker. This is an absolutely wonderful product! I use it on all my furniture in the house, including 100 year old antique wood furniture. It leaves a beautiful shine that is not greasy. The dust seems to stay off the wood longer so I don’t have to dust as often as I did with Pledge. My husband really likes the orange scent. He’s picky about cleaning smells in the house and this one has a nice light orange scent that isn’t overpowering. It truly is a great product!